Once upon a time, it was raining in Chicago and a friend pointed out that my plain black umbrella was simply inappropriate. Why in the world didn't I have an orange one? Easier said than done. Where does one get a cute orange umbrella? Lo and behold, a few weeks later the kind folks at The Umbrella Society emailed to introduce their shop, and I was in love. My black umbrella has now been replaced by some lovely orangeness. Browse the store! Get free shipping when you buy two. And best of all, money from the sale of each umbrella goes to help fight teen suicide in Japan and fund an orphanage project in India. my fave is the bottom right. i guess you missed the bright orange cheapies ikea had this past winter? just as well. these are much better and i love that they are giving to a good cause. Oh, I did miss those. Oh well. love the clear rose in yellow- so cheery!! top right is my fav. i have pledged to leave a message on all the blogs i read for the next 2 weeks. As orange is also my fav colour, of course your blog is on my reading list! I love all the ideas and crafty bits you post about, thank you! I'm torn...they're all so cute! How funny. I'm super sun-sensitive, and there's a site that makes custom parasols with sun-blocking fabric as a lining. I was toying with the idea of using one of your fabrics on top! Thanks to you I can finally admit how much I LOVE orange! Check out the very cool teapot I found, created by Beehouse tea pots! They call it tangerine...and I love that! I want matching boots so I can go puddle jumping! Fabulous! Thanks for the Christmas gift idea!! oooOOOOooo ... 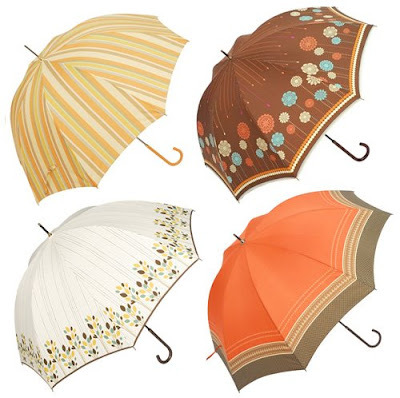 I'm so tempted, but my umbrellas (and sunglasses) have a tendency to walk away when I'm not looking. GREAT blog! orange is my favorite color so I knew I would love it. I thought it would be fun to see what umbrellas other creative-types use. These are all so cute! And sunny! Ohh, just checked out their shop. They have some great umbrellas. Would make a great Christmas gift.